Guerilla Baseball Camps this summer in Mandeville! 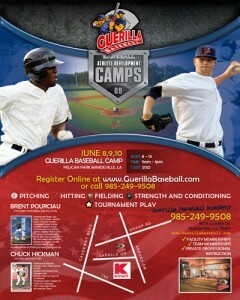 Guerilla Baseball Academy is holding a Baseball Camp at Pelican Park in Mandeville, LA on June 8,9,10. Guerilla Baseball is also holding a Pitching Velocity Camp at Guerilla Baseball Academy on July 8,9,10,11. If you would like to register for the camps or read more about them please select the “Camps “link above in the main navigation. We plan to run more Camps this summer so if you can not make the dates above then fill out the form below to request dates for a camp that would work better for you. 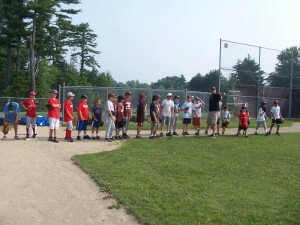 Most of our camps will include instruction for pitching/throwing, hitting, fielding and strength and conditioning. During our June 8,9,10 camp all players will be dividend into teams for tournament play at the end of the day. Awards will be given for the winning team and most valuable player. Guerilla Baseball Camps are a great way to learn proper mechanics and strength and conditioning from Professional Baseball Players. The camps will be run by Coach Brent Pourciau and Coach Chuck Hickman. You can read about these coaches by selecting the â€œAboutâ€ link above. Could you please send me some information for your summer camp for my 6 year old son. If you sign up for the Guerilla Newsletter you will receive this info when the summer nears.